This great British custom was started by the Duchess of Bedford in 1830 when she ordered a light meal to stave off hunger pangs between lunch and dinner. Now London revives the Afternoon Tea tradition to the tinkle of teaspoons, slurping of tea and swooning over scones. Named the Tea Guild's Best Afternoon Tea in 2006, 2011 and 2012, and presented with an Award of Excellence an impressive five times, Claridge's is one of the top locations for Afternoon Tea in London. Served in the Foyer and Reading Room, the hotel boasts all the details needed for the traditional British custom. The Art Deco interior of Claridge's saw a stunning refit in 1999, bringing it back to its awe-inspiring former glory and worthy of its affectionate title "the extension to Buckingham Palace". The centre piece of the Foyer is a huge glass chandelier by Dale Chihuly, adding to the magic of the venue, and the Reading Room is ideal for intimate occasions. 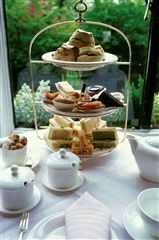 Diners are accompanied by a pianist and harpist while they choose between more than 40 different blends of tea from around the world and devour classic finger sandwiches, pastries and moist, fluffy homemade raisin and apple scones served with Marco Pollo jelly and Cornish clotted cream. There are three delectable options: the traditional Afternoon Tea, the Champagne Tea and, for really pushing the boat out, the Rose Champagne Afternoon Tea. Seasonal options for the Chelsea Flower Show, Lawn Tennis and Christmas are also available, as well as a Children's Afternoon Tea. If you want to join the ranks of princes, politicians and personalities, this is the only place to sup afternoon tea. Continuously voted the best place for Afternoon Tea in London by The British Tea Guild. Continuously voted the best place for Afternoon Tea in London by The British Tea Guild, The Goring Hotel sits cheek by jowl with Buckingham Palace and has been owned by the same family for three generations. Appropriately, given its royal neighbour, Kate Middleton spent the night before her wedding here and David Linley is responsible for the decor in the restaurant, his signature classic yet elegant style making the dining room surprisingly unstuffy. The Goring was praised by The Tea Guild judges for the flexibility of the venue where guests can enjoy tea by the fire in colder winter months or take tea in the garden outside when the sun shines. But it's The Goring's "elegant surroundings, faultless presentation and friendly, efficient and knowledgeable staff" that really impress. Winner of numerous awards, this hotel has been a byword for style and comfort for over 70 years. Served in the famous marble and gold Promenade entrance lounge of The Dorchester, diners can chose to indulge in a Traditional or Champagne Afternoon Tea before drinking in the extravagance of the lavish setting. Palm tree fronds flutter above elegant couches while bright sun-light streams through the windows. There's also the option of a Vintage Afternoon Tea, served on the intimate balcony overlooking the iconic lobby, or a selection of themed afternoon teas, such as Wimbledon or Mad Hatter's. Choose from a varied selection of 20 imported teas, or go for the Dorchester's very own delicate blend. The hotel employs its very own tea chef, solely in charge of the afternoon's selection of finger food, not to mention the 15-strong team of pastry chefs who intricately fold together the mouth-watering range of sweets. Their scones have been made to the same delicious recipe for over 50 years, and we can tell why. The Dorchester is perfect for those traditional afternoon tea takers for whom glamour and glitz coupled with eyeing up fellow diners is part and parcel of the whole ritual. Adam Handling presents an afternoon tea inspired by childhood feasts at his Grandmother's. One of the hottest chefs of the moment, Adam Handling presents an exquisite Afternoon Tea at Cadogan's by Adam Handling, the new tea lounge within the Belmond Cadogan Hotel in Chelsea, which is also home to Handling's headline restaurant. Nine months in the making, the afternoon tea is a celebration of the chef's childhood, inspired by the feasts he used to have at his grandmother's. The nostalgic yet refined menu commences with a selection of traditional finger sandwiches filled with smoked salmon and crab salad, duck egg with curry mayonnaise, and cucumber with creme fraiche while other savouries include mushroom and truffle egg and a sausage roll with brown sauce. Sweet dishes include granny smith and lemongrass cremeux, battenberg lemon drizzle, and salted caramel sacher with milk chocolate Chantilly, and plain and raisin scones come with homemade jam and Cornish clotted cream. Guests can wash it down with a fine Newby Tea and/or a glass of Adam Handling's Own Label Sparkling. 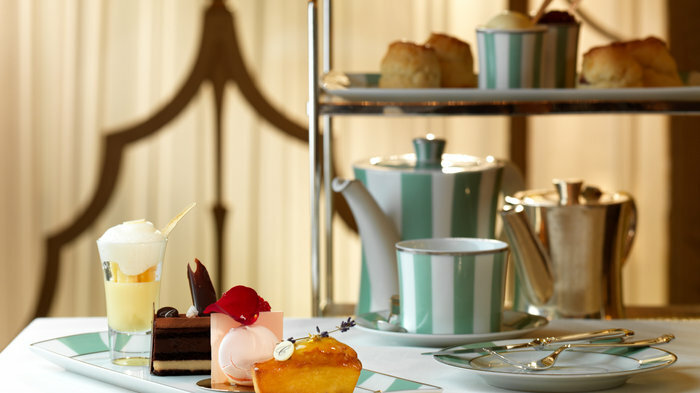 Tea at The Ritz has to be the London equivalent of Breakfast at Tiffany's - a world-famous brand that captures the essence of each city's history and culture. Synonymous with the comfortable colonialism of the old British aristocracy, for Londoners afternoon tea at The Ritz conjures an image of luxury, indulgence, formality and impeccable service. Detailed in delicate shades of gold, pale green and pale pink, the Palm Court, where afternoon tea is served, is an exemplar of soothing sophistication combined with lavish Louis XVI luxury. Lofty ceilings, glittering chandeliers, gilded trellises, marble columns, deep cornices and draped floral curtains all combine for a visual treat of the old Establishment. Waiters, dressed immaculately in tails, serve up tea in fine bone china with exact precision while a pianist tinkles the ivories and a harpist plucks away in the background. Views of the Green Park royal gardens are a stunning reminder of a time when King Edward VII, Winston Churchill and Charles De Gaulle formed part of the regular stream or royal, aristocratic and noble visitors taking tea at the hotel's Palm Court. It hardly needs saying but dress smartly - a jacket and tie are essential for men. Early booking (as far in advance as 12 weeks for weekend sittings) is essential. Feast on quintessentially British cakes under a magnificent crystal chandelier. Served in the grand Lobby Lounge, afternoon tea at the Corinthia is a classy affair. Diners are initially greeted by the magnificent sight of the 'Full Moon' chandelier, created by Parisian designer Chafik Gasmi and made up of 1001 glistening Baccarat crystals. The menu focuses on quintessentially British cakes, including Battenberg, Eccles cake and Bakewell tarts. Taking into consideration Londons major events, special seasonal options are also often added, such as floral fancies inspired by the Chelsea Flower Show or couture biscuits in honour of the latest catwalk trends from London Fashion Week. Sandwich options include smoked salmon, coronation chicken, Lancashire cheese and piccalilli, and cream cheese and chive while a selection of plain and fruit scones are served with house preserves and clotted cream. Guests can choose between an array of teas, including bespoke blends created especially for Corinthia London's Tea Palace, and there is also the option to enjoy a glass of Laurent-Perrier Champagne. L'oscar's afternoon tea takes inspiration from the Baptist Bar with a Saint and Sinner theme. Inspired by the L'oscar hotel's Baptist Bar, which is housed within a former chapel dating back to 1903, Cafe L'oscar takes on a Saint & Sinner theme for its decadent afternoon tea. Served against a richly decorated backdrop of mirrors, gilded panels, original art and a striking illuminated onyx bar, the afternoon tea commences with Religieuse buns followed by finger sandwiches filled with devilled chicken, rare roast beef and poached salmon. The suitably themed sweet treats include Adam and Eves pudding, Devils food cake and Saint Nectaire and blood orange cheesecake, and no afternoon tea is complete without traditional scones served with cream and jam. To wash it down, saints can choose from an extensive tea selection while sinners can sip on indulgent tea-based cocktails, including the Charon au champagne with Rooibos tea infused Ketel one, blood orange and champagne. Enjoy traditional afternoon tea in the Jean-Georges restaurant. The Connaught in Mayfair was originally intended as an oasis of calm for the landed gentry of England to retire to during their hectic visits to the capital. Little has changed since the opening of the hotel in 1897 - doormen in top hats and white gloves still usher guests into the majestic entrance hall with its magnificent mosaic floor and grand wooden staircase, and the age-old tradition of afternoon tea is still re-enacted daily. The Connaught's afternoon tea is served daily in the Jean-Georges restaurant. Choose from a selection of fine teas served alongside a menu of finger sandwiches, pastries, and plain and raisin scones serves with homemade strawberry jam, lemon curd and Cornish clotted cream. For an extra dash of luxury, opt for the Champagne Afternoon Tea experience. If you're feeling a little over-indulged, then skip the lifts and enjoy the traditional country house feel of the mahogany staircase that winds up through this grand century-old hotel. The Connaught is a traditional slice of Mayfair grandeur that takes its design cue from the English country house while offering facilities that are absolutely up-to-date. Indulge in some mad and delicious afternoon tea at The Sanderson Hotel. Sanderson Hotel gives visitors the chance to climb down a rabbit hole and explore the wonderland beneath at their Mad Hatter's Afternoon Tea. Creating a twisted version of the traditional British afternoon tea, menus are hidden inside vintage books and napkins are wrapped with riddles, while teapots adorned with kings and queens and sandwich plates featuring birdcages, carousels and ticking clocks play host to wondrous fare. Re-launched in 2015 to celebrate the 150th anniversary of Lewis Carroll's Alice's Adventures in Wonderland, the menu is a heady mix of colourful savoury dishes and striking sweets. Offering something more than just finger sandwiches, the savoury options include a crab Ã©clair and a croque-monsier, while traditional flavours still feature with a smoked salmon and caviar scotch egg and a cucumber and cream cheese sandwich on fresh lime bread. Each of the sweets are beautifully intricate, with every aspect carefully constructed and perfectly matched with the Alice in Wonderland theme - the menu took four months to finalise and the level of detail is apparent. From the red velvet ladybird and blue caterpillar to the Queen of Hearts Oreo cookie soldier and magic marshmallow mushrooms, each addition tastes as good as it looks. Scones are light, delicious and generously portioned, the themed teas perfectly balanced, and the Alice drink me potion a refreshing conclusion. It's all gloriously bonkers. A modern take on afternoon tea with unrivalled views of London. The Galvin Brothers present a modern take on traditional British afternoon tea. The Athenaeum Hotel in Mayfair is renowned for its afternoon tea having previously been awarded the Tea Guild's prestigious Top London Afternoon Tea accolade. Now that the Galvin Brothers have taken over, serving finger sandwiches and scones in their British restaurant, Galvin at The Athenaeum, we suspect that the standard has been kept suitably high. Their modern take on British afternoon tea sees them serve a selection of sandwiches, scones and sweet treats made from the very best British ingredients. Expect smoked salmon from Severn & Wye, Cumbrian ham, Kentish strawberries and Devonshire clotted cream. Diners can also opt for the Gentleman's Afternoon Tea or Chocolate Afternoon Tea. And, to make the occasion extra special, why not opt for a glass of Lanson champagne to wash it all down? You are dining in Mayfair, after all. Afternoon tea is served within the former taxi rank at this grand hotel. The Hansom Lounge at the St Pancras Renaissance Hotel occupies the former cobbled driveway where Hansom cabs used to drop off and pick up their passengers. With glass panels and a vaulted high glaze ceiling, the lounge combines Victorian splendour with contemporary style and offers a unique location to enjoy afternoon tea. Served daily from 1.30pm, the Classic Afternoon Tea menu comprises of a range of sandwiches that put a modern twist on the traditional selection. Options include roast turkey, chipolata and smoked bacon cranberry in brioche; lobster and clementine mayonnaise in brioche; and smoked salmon and lemon crème fraiche on brown bread. Blueberry and white chocolate scones are served with Cornish clotted cream and strawberry jam, and sweet treats include an Oreo choux bun, pear and pistachio layer cake, ginger crispy marshmallow and salted caramel macarons. Guests can also choose to opt for the St Pancras Afternoon Tea, which provides the option of enjoying either a cocktail or a glass of Perrier Jouet Champagne with their tea. One of the capital's top museums serves a traditional Victorian afternoon tea. Providing the chance to enjoy a quintessentially British experience within one of London's most beautiful buildings, Benugo has partnered with the Victoria and Albert Museum to serve traditional Victorian Afternoon Tea. The award-winning British food business and the renowned museum invite visitors to feast on sandwiches and scones within the lavishly decorated Morris Room, which boasts a historic interior that was part of the V&A's original refreshment rooms. Curated by award-winning food historian Tasha Marks, the menu is filled with dishes inspired by 19th-century recipes, subtly tweaked to suit the modern palate. Think Mrs Beeton's cucumber sandwich, first seen on menus in 1859; iced orange cake, circa 1891; lemon and caraway poppy cake, circa 1895; and the traditional Victoria sponge which first appeared on Victorian tables in the 1800s. The feast is served with a selection of organic loose leaf teas and an optional glass of prosecco. Sip on champagne and nibble on finger sandwiches while surrounded by gothic design. A tranquil heaven hidden within London's famous department store. From the day Fortnum & Mason opened its doors to the nation back in 1707, tea has been one of their main concerns and the St James's Restaurant opened just a few years after the British discovered their now beloved cuppa. However, in 2012 the restaurant was given a grand refurbishment and, opened by Her Majesty the Queen, the Duchess of Cornwall and the Duchess of Cambridge, was renamed The Diamond Jubilee Tea Salon. Fortnum's is the original London tea house. The fabulous food hall downstairs stocks over a century of blends including India, Nepal, Japan, Sri Lanka, along with their own in-house infusions, green teas and all sorts of fruity numbers. Tea tasting really is a fine art and these are the experts with nearly 300 years' experience. The calm atmosphere, pacifying piano and broad view of Piccadilly makes the fourth floor Tea Salon a tranquil haven away from the sea of shoppers outside. The reputation of the food hall precedes it, and the sandwiches and pastries live up to expectations. Choose from a Traditional Tea, a Savoury Tea or the more substantial High Tea. Afternoon tea is served in two contrasting rooms at Sketch. There's one traditional afternoon tea menu at Sketch but it's served in two very different locations: Glade, a fairytale dining room that features ethereal woodland murals and earthy wicker furnishings, and the Gallery, designed by India Mahdavi. Originally featuring work by Martin Creed, the Gallery now displays work by David Shrigley as part of a long-term programme of artists-conceived restaurants. The afternoon tea menu is the same for both experiences with towering assortments of sketch sweet pastries, dainty macaroons and delicious savouries offering true afternoon tea innovation. Diners can also choose to add either a glass of champagne. Afternoon tea is not to be confused with high tea. Afternoon tea is served around 4pm and was originally introduced as a stop-gap between lunch and dinner at a time when dinner was served at 8pm. The original intention has become somewhat lost as today we treat afternoon tea as a treat, an excuse to eat scones laden with clotted cream, pastries and cucumber sandwiches. High tea, by contast was, for many workers, the main evening meal of the day. Taken between 5pm and 7pm, or after work was finished, it consisted of savoury dishes such as pies, cold meats, cheeses and bread. Many people still call their evening meal 'tea' - which they take instead of a later supper. The one thing afternoon tea (low tea) and high tea have in common is that they're both accompanied by a pot of hot, freshly brewed tea. 'Low' and 'high' refers to the table height at which tea is taken. While afternoon tea was typically taken on low seating, high tea was at the main kitchen table. Anna Russell, the 7th Duchess of Bedford is often credited as the person who started the trend for taking afternoon tea. Eating habits in the 1830s meant it was usual to have a long gap between the relatively light 'luncheon' served around midday and dinner served around 8pm. So, feeling a bit peckish, The Duchess of Bedford, who was a close friend of Queen Victoria and a prominent figure within London society, requested that light sandwiches, tea and cake be brought to her boudoir in the late afternoon because she had a 'sinking feeling' due to the long gap between meals. Other social hostesses followed her lead and the pause for tea became a fashionable social event. During the 1880s upper class and society women would change into long gowns, gloves and hats for their afternoon tea which was usually served in the drawing room between 4pm and 5pm. This centuries-old tradition has been revived lately and London's top hotels are among the best places in the country to enjoy an award-winning afternoon tea. From cheap budget hotels to luxury 5 star suites see our special offers for hotels, including London Hilton on Park Lane from 53% off.